Backyard swings don't have to be the normal belt swings. Spice up the swing set in your backyard with several different types of swings. A popular favorite is the tire swing. The LifeBuoy Swing and the Vortex Ring Swing are variations on the traditional tire swing and are a lot of fun! The great thing about these three types of swings is that multiple kids can swing at one time. Gliders are another variation on the swing that can also hold multiple kids. The 2 for Fun Multi Child Glider and the Mega Rider Multi Child Glider are two popular choices! 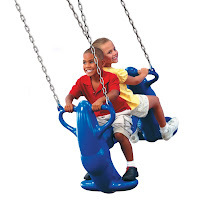 We have several different types of swings available on our site. Visit the accessories section to see what we have!